It seems that Samsung’s plan on expanding the Galaxy brand of devices is showing no sign of slowing down, not in the least with the latest announcement of the Samsung Galaxy Grand. It is said that the South Korean conglomerate has carefully positioned the Samsung Galaxy Grand to be an ideal smartphone for those who live fast-paced mobile lifestyles as well as demand far more from their smartphone compared to a standard user. Let us dig into just what the Samsung Galaxy Grand can deliver, shall we? For starters, the Samsung Galaxy Grand will be powered by the Android 4.1.2 Jelly Bean operating system, which should be good enough and leave you no room for any complaints. 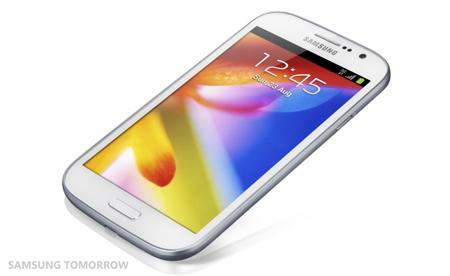 If you want to look for a device with Android 4.2 Jelly Bean, well, the Samsung Galaxy Grand just isn’t for you. Not only that, the Galaxy Grand will also feature a vivid 5.0’’ display (no Full HD resolution here unlike other high end devices in the market like the HTC Droid DNA and Oppo Find 5) that promises to deliver an expansive viewing experience, letting you view messaging, multimedia and Web content in brilliant color and clarity. Despite packing quite a generous display, the Galaxy Grand remains modest in terms of its design, being slim, ergonomic and comfortable to hold. Thanks to the Multi Window feature, you are able to enjoy true multitasking ability while running multiple apps all at once without the need to switch screens. There is a dual-core 1.2GHz processor underneath the hood that keeps everything running just fine, and while it is not the fastest kid on the block, it should still be able to handle some of the more demanding apps and games in the market without missing a beat. The camera is also one point to look out for, boasting zero shutter-lag and ultra-quick camera start-up. Thanks to its backside illumination sensor, it will pave the way for clear shots even in dark conditions, in addition to offering Full HD video recording capability. No idea on pricing or availability, but the Samsung Galaxy Grand should keep the busiest of bees happy thanks to its Dual SIM capability. Are you interested in picking one up?